INVENTORIUM card games form a steady habit to think inventively, which allows finding solutions to problems that seem to be unsolvable at the first glance. Like all games, INVENTORIUM puts you in a good mood, trains teamwork and partnership skills, sparkles your imagination, giving the solutions for seemingly unsolvable problems and train you to deal with risks. Solution cards have been distilled from millions of the most successful patents and the best "inventions" in living nature. Specially designed images improve concentration and memory, sparkle imagination and develop excellent problem solving skills. The cards are designed for family games, but also can be used in business coaching for icebreaking and team-building exercises. Teaching innovative design and TRIZ (theory of invention) at the University of Bath for 15 years we helped students to improve their examination scores by 20% in average. INVENTORIUM card game is the result of long time development of teaching methods to support creativity and innovation in international and multi-cultural groups of students. The background research was commissioned by the European Space Agency to trigger creative thinking and to tap into all of astronauts’ knowledge and experience to resolve unexpected challenges. Astronauts are bound by limited resources on their spacecraft and must be innovative while on a mission to the Moon and Mars. 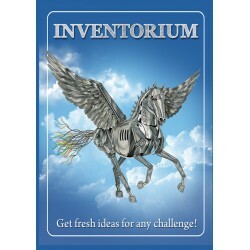 Use INVENTORIUM cards to sparkle your imagination and come up with bright ideas. Game improves associative thinking, teambuilding, inspires fantasy and creativity. Remove challenge cards from the deck. Put the pile of solution cards in the middle face down. Each player writes a random phrase on a paper and folds it. All sheets are mixed in a hat. A player draws a random sheet with a phrase from the hat and reads it. Then all players in turn draw a card from the deck and continue the story following associations triggered by the card. The story ends when completed. The game ends when all papers mixed in the hat are used. No winners, just fun! Game betters short-term memory and concentration. Lay 10 cards on the table face up. Try to commit to memory all cards and their order in 60 seconds. Then turn the cards face down. Write or draw all cards you remember on a piece of paper. Turn the cards face up and count your correct answers. To train your memory increase the number of cards. Game sparkles imagination. Deal all cards. Players who have challenge cards shout out their challenges in turn. Other players who have relevant solutions act out the picture on their card in turn. Others guess what has been acted. A card which was guessed can be discarded, card which was not guessed stays in hands of a player. Pegasus card give the right to drop any three cards. The winner is who plays all his cards. Game trains problem solving skills. Divide cards in 2 piles: Solutions and Challenges. Deal all cards from the Solutions pile. Decide on ultimate desire to address. The first person takes a card from the Challenges pile and reads it. Everyone who has matching solution cards to the colour of the frame of this challenge card puts them face up on the table. Set up timer for three minutes. Each player in turn tells and writes the ideas on a piece of paper. Remove used solution cards from the game. Those who do not have solutions miss the turn and keep the cards. After the first round pull a new challenge card from the pile and continue the game. Pegasus cards allow help from others. The winner is the one who has the longest list of solutions or the one who used all the solution cards. It is experimental deck the price is high but we aim to reduce it sufficiently by printing more copies. So, for everyone who buys cards now, the next new published game will be sent for free to express our gratitude for support. We plan the following new table games to publish by the end of summer 2017: "Bio-Inventorium" , "Anterprise" and "Buzzness" games.